Who’s the pretty girl in that mirror there? Why its a mermaid with beautiful long, flowing locks of hair. This mythology-inspired mermaid drawing dates back to 1888 when it was used as filler in an otherwise unillustrated work. Without all of the wonderful page spacers images like this one, it would have been one of the many books I look through and don’t spend much time with. Instead, I consider it a lucky find. 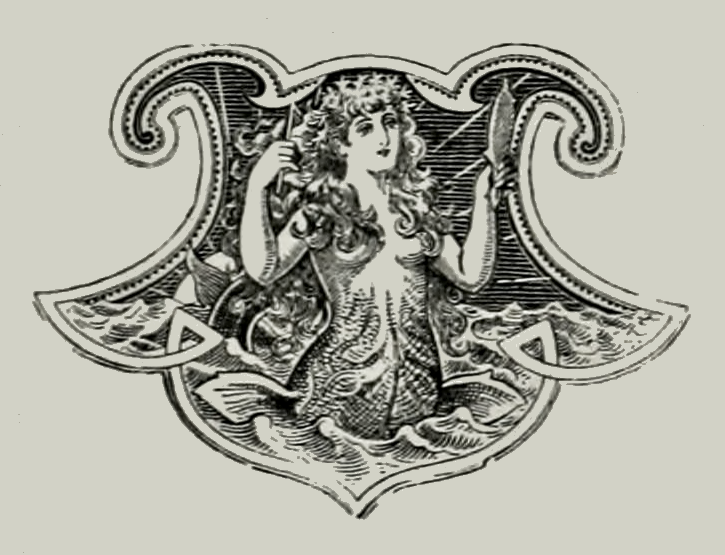 The mermaid in this vintage, public domain drawing is tending her hair. How very lovely it is. But, once she dips back into the sea, won’t all of her work be for naught? Behind and to the left is her tail, just breaking over the waves. Her hips have a pair of fins too. She is framed in a somewhat oddly shaped frame that is part square and part triangular. So pretty to look at. So ready to be given new life in a modern work.